My husband spent years of running from morning till night all throughout Walt Disney World. Then suddenly after several major surgeries, he was no longer able to walk for more than 20 to 30 minutes at a time without sitting to rest his legs for 15 minutes. So when I began to plan a family trip to WDW in 2009, my husband wanted to stay home. “Don’t be silly!” I said. “We will rent an ECV.” His reply was “Absolutely not! I will be embarrassed, people will think I am lazy especially if I stand and walk to stretch my legs!” Unfortunately he had not yet become used to his more restrictive life. When I indicated I would not go without him, he agreed to go with the warning that we would have to sit and rest as often as possible. Upon arrival at the Magic Kingdom on our first day, I sat him on a bench since the walks through the resort to the bus as well as from the bus to the park entrance had tired his legs. I told him I had to use the restroom. Instead, I went directly to the Wheelchair Shop to the right of the MK entrance to rent an ECV. When I drove the ECV to where I had left him waiting, he was not very happy! By the end of the day, however, he said “Thank you for doing that for me – I’m glad you rarely listen to what I say!” Renting from WDW works for my family. My husband still requires a certain amount of exercise, so walking through our resort (with some rest stops) and walking from bus stop to park entrance is do-able. His only issues are walking all day and for long periods of time. Bring your own (your own must fall within the 32” x 48” size required for use on the Disney transportation). Renting from WDW is an added expense that must be considered in your trip budgeting. The cost is currently $50 per day at the four theme parks, with a $20 refundable deposit when the ECV is returned at the end of the day (if renting at Downtown Disney, the cost is $50 per day with a $100 refundable deposit). So a 5 day stay adds an additional $250 to your trip. Disney does offer a “Length of Stay Rental” ticket. You make a one-time payment for the number of rental days you require, and upon entering each park you show your receipt. From there you will be shown through the queue with little wait. There is a very small discount when done this way. Many have a fear they will not be able to rent an ECV at the parks since they do not take reservations and they publicize that they cannot guarantee availability. I have never experienced an inability to rent one at any of the parks, even during busy times. If park hopping during the day, show your receipt at the next park and you will be on your way once again! Many prefer to rent from an outside vendor to save some money. There are many rental companies in the Orlando area – some as much as half the cost of a rental from the parks. These companies will deliver and pick-up to your resort. However, there is now one catch to that system. 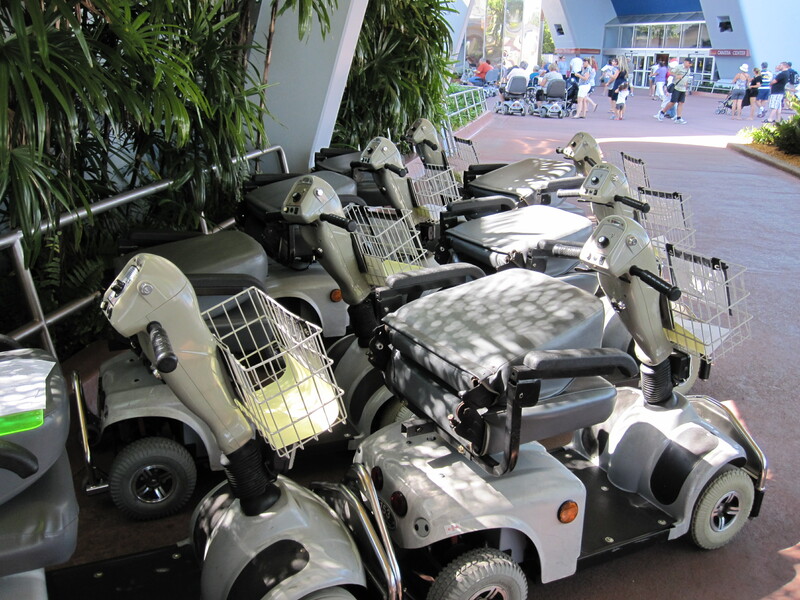 Effective November 1, 2012, WDW implemented a new ECV rental policy. There are now only five APPROVED rental vendors that are allowed to drop off rentals at the front desk/bell services of a Disney resort to be held for a guest. If you use a vendor that is not on this approved list, you will have to make arrangements for specific meeting times for the ECV to be delivered in person and picked-up from you, in person, at the end of your stay. However, there are also disadvantages. You have to transport the scooter and be sure the scooter is sufficiently charged. There is also no coverage for theft but some do offer limited insurance against damage. I can only assume that the five “preferred” and approved vendors above have been found by Disney to be the most reliable when it comes to servicing customers when there is a problem. They are also likely to be the most reliable in delivering and pick-up to the resorts. If using a Certified Disney Travel Specialist to book your vacation, they will be able to include rental from any of the five approved vendors to your package.